This also isn’t accounting for fallout winds. It’s really tough to predict where anyone might survive, since it all highly depends on where a nuke lands, your access to a bunker, etc. So it’s possible that Nate Silver’s prediction might be more accurate. However, considering how close Alaska is to Russia, we had a hard time leaving it untouched on our map, so we didn’t include it above. 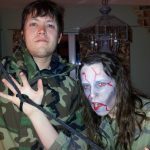 They used five criteria to determine which states were most likely to survive a zombie apocalypse (fewest people per square mile, gun ownership per capita, physically active population, interest in zombie media.) Honestly, we feel that Texas should be on this map too, but that’s not what Estately found.